Manufactured in Grande-Bretagne from 1929 until 0. When I bought this unit, it looked like a shipwreck on a beach after several years of sea. cladding had largely disappeared, eaten by an unidentified animal and moisture. Worms did use a tooth (worms have no hand). Woodwork were aerated by small holes. Mechanical was the image of outside. The thing dragged on my workbench as Zangra to Belonzio. Repair never came. it was bored until I confided it to Don Bruno. He has no horses, but knows how to do. The camera left Belonzio to the Loire . It came back transformed and now we drink to the health of Bruno. More seriously, when restoring a question arose. Originally, the cone of sight of this device has three folds. His owner had it modified to have two folds only. Should it return in original condition or leave it to the state selected by the owner. I chose to respect the last owner and has asked Bruno to keep two folds. They pose a mechanical problem. Unitarily, they are longer than when they were three, which hinders the complete closure of the framing cone. This probably bothered the last user ... and it will continue like that. The camera consists of a wood structure, with a completely metallic inner. It is covered in real leather, except at the base of the cone of sight, where there is a metal plate covered with a frosted paint. There is a strap ring on each side, but I can not imagine carrying that thing around the neck. 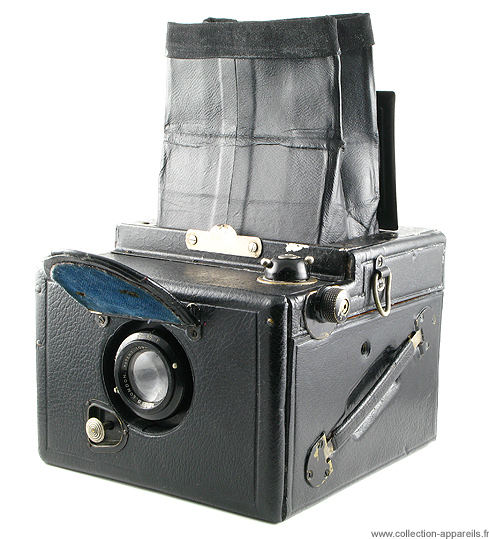 The lens is not very good and the shutter button on the front, is particularly poorly located. focusing is made by means of a small wheel on the right side (in the picture) while the film advance is by a large knurled knob located on top of the unit. It would have been nice to also have a large knob to adjust the distance.